This is a guest post by Jay Murry. He is the Internet Play-By-Play Announcer for Washington University in St. Louis. You can follow him on Twitter here. I have always thought that old dogs could be taught new tricks, just as well as new dogs. The key to training both is cultivating the desire within them to learn the new tricks. Yours truly, a relatively old play-by-play dog, learned some new tricks and had a lot of fun doing so during the recently-ended broadcast season at Washington University in St. Louis. In the 2014-15 broadcasting season at Wash-U, I was thrilled to be given the opportunity to call more games in men’s and women’s soccer, in men’s baseball, and I was given the PBP assignment of women’s softball for the first time. It is a compliment to be entrusted with adding those sports to a PBP list that began as being limited exclusively to football and men’s and women’s basketball. Regarding soccer and softball, being entrusted with the call of those sports also meant accepting the responsibility of learning more about those sports. Otherwise, a season of stumbling broadcasts would threaten my ability to hold onto those delightful assignments for next season. I have always enjoyed watching soccer, perhaps more so than the average American sports fan. The years of watching matches and programs like “Soccer Made in Germany” gave me a basic foundation of vocabulary terms and pacing to utilize in my broadcasts. This play-by-play dinosaur soon realized that there were more specific descriptors to be learned about soccer. For example, I discovered that a “dummy” was not a derogatory term directed toward another person; and a “Cruyff” is a reverently named for the soccer legend that developed a unique change-of-direction maneuver. Equally as important was learning that there are games within the game that need to be highlighted, in order to enhance a fan’s viewing or listening experience of a soccer broadcast. Since soccer matches are at least 90 minutes in length with low scoring, at first glance there appears to be very little going on at any point within them. That doesn’t compel many viewers and listeners to stay with you, if you likewise call the match under the assumption that soccer is a boring sport. The trick is to reveal the smaller games that are going on, within the larger context of the single match. In a scoreless match, is one team so dominant with ball possession and advancement that a decisive goal could occur at any moment? Does a team have a goalie playing like a Godzilla; looming large and destroying the opponent’s scoring chances and reducing its psyches to rubble in the process? Likewise, at first glance it appears that softball is just like baseball, so there is no need to do any extensive studying of that sport’s terminology. That would be an incorrect assumption, of which you will be reminded by a fan or two the first time you refer to a softball pitcher walking to the “mound”. Softball pitchers reside “inside the circle”, not “on the mound”. Using the term “mound” was in my default drive from playing baseball through high school, and calling several baseball games before receiving the softball PBP opportunity at Wash-U. I was politely yet quickly reminded that my default drive needed to be changed, after I first referred to the circle as a pitching mound. Along with that divergent vocabulary difference between baseball and softball, there were other new things to learn about softball. The Designated Player (DP)/Flex position is far more complex than baseball’s designated hitter, especially with the re-entry rules for college softball players. 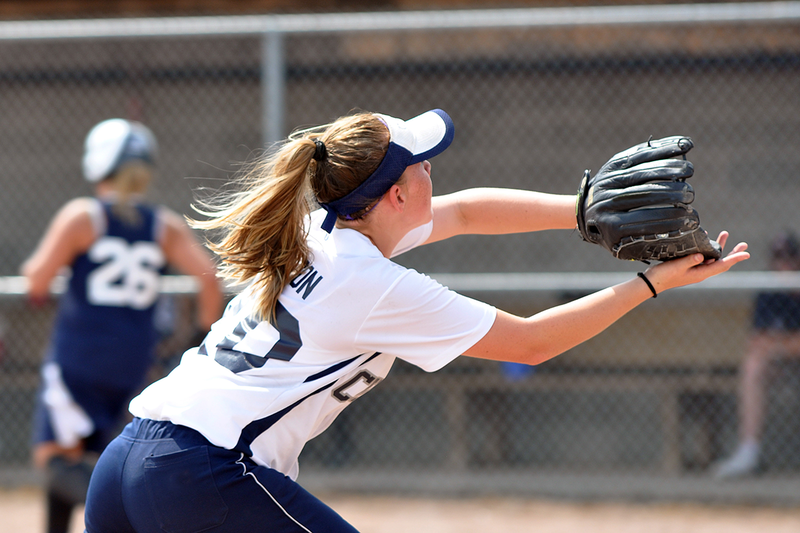 Because of softball’s shorter base paths, fielding ground balls cleanly and quickly is vitally important to keep runners off base; and ground-ball double plays are relatively rare. Bunting is a premium skill in softball, and its use is far more prevalent than in baseball. Those are some of the unique features of softball that I had to learn, in order to be an effective and credible PBP announcer of that sport. Fortunately, I was not like the proverbial and stereotypical old dog. I was an eager sponge, soaking up new tricks of information about the sports that were new to my PBP regimen. As a result, my broadcasts of softball games and soccer matches were well-received by our viewers and by the administration of Wash-U’s Department of Athletics. And, I have been rewarded by receiving a full season of broadcasting home soccer matches this fall, along with another full season of home softball games next spring. I now am the primary voice of four Wash-U sports…and who knows? If we expand our play-by-play menu at Wash-U even further, I will be in a position to expand my PBP role as well; now that I have shown the ability and the desire to be a versatile PBP broadcaster. I wouldn’t have received those treats and opportunities to broaden my play-by-play horizon, if I hadn’t been willing to leap off the couch with a tail-wagging enthusiasm to learn new tricks. So, when someone approaches you with similar play-by-play treats, be ready and willing to learn how to call sports that are new to you. It may lead you down a path that will forever enhance your play-by-play career, no matter if you are a young or an old dog!